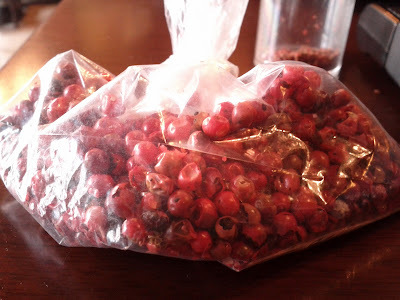 Pink peppercorns were recommended by a friend, Amanda, as a possible pairing with espresso. She explained they have a mild spiciness similar to that of black pepper, but with a sweet twist. They can and are used in desserts. As I found out yesterday at Kensington Market, they are also very expensive and hard to come across. One shopkeeper explained she only had it in a pepper mix because it was $60/lb for her to buy. The shopkeeper next door bit the bullet and was selling them for $75/lb. I bought the minimum amount, a $3 baggie, so we could try it out. At first we tried the tiniest pinch, thinking that the pepper flavour would storm through like a bull through a glass-wares counter. Apart from a hint of aroma, it was undetectable. So, we doubled down and tried again with twice as much. This time the aroma came through strongly and mingled well with that of the alluring Steampunk coffee blend. There was a slight tickle of spice at the back of the throat, and a very mild peppery taste, but none of the sweetness came through. It didn't take anything away from the brew, but it didn't add anything either. The mild pepper sharpness was perhaps a bit unnerving. As Brian put it, "I wouldn't recommend this as a relaxing cup of coffee." Well said. This one is a pass, sorry Amanda.